This is an English locational surname. It originates from the village of Cockayne Hatley in Bedfordshire, recorded as Hattenleia, in the Anglo-Saxon Chronicle of 960 .a.d, or from either East Hatley and Hatley St. George, recorded as Hateleia in the Cambridge Inquisitions of 1080. The three Hatleys are situated close together on a piece of elevated land, and the first element is believed to derive from "hatt", a word meaning the top of the hill, with "leah", a fenced area suitable for agriculture, a farm. Cockayne Hatley came into the possession of the Cockayne family in 1417, and Hatley St. George was held by Sir Baldwin de Sancto Georgio in 1282. Locational surnames, such as this, were originally given to the lord of the manor, and as a means of identification to those who left their place of origin to settle elsewhere. The coat of arms associated with the surname has the blazon of an blue shield charged with a silver sword in bend, hilt and pommel gold, between two gold mullets of six points pierced. 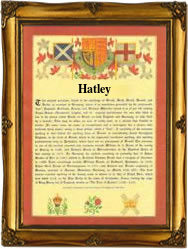 The first recorded spelling of the family name in church registers is belived to be that of John Hatley. This was dated January 23rd 1541, when he married Agnes Barlow at Grantchester, Cambridgeshire, during the reign of King Henry V111th, 1509 - 1547. Surnames became necessary when governments introduced personal taxation. In England this was sometimes known as the Poll Tax. Throughout the centuries, surnames in every country have continued to "develop" often leading to astonishing variants of the original spelling.